One of the most utilized, yet least understood, convention of timekeeping is the seven-day week. Although an English speaker can easily see that these days are named after the planets and/or gods, the original polytheist-astrological significance behind this system is largely unknown to people. This system is also employed in modern Japan: do-yōbi 土曜日 (Saturn's Day), nichi-yōbi 日曜日 (Sun's Day), etc. A vestige of this system is still preserved in China, where Sunday is xingqi-ri 星期日. In this system, every hour is governed by a planetary deity. I should emphasize here that ancients did not regard the planets merely as curious stars that wandered about the sky, although the word planet is indeed derived from “Greek planetes, from (asteres) planetai 'wandering (stars)' (see Online Etymology Dictionary). As I've discussed in earlier posts, the planets are named after gods and were treated as such. The seven-day week was not designed as a convenient way of tracking time, but rather it is a religious calendar. One might argue that it ought to instead be considered astrological, rather than religious, in nature, but this again leads to a topic that I've brought up before: astrology is religion. Astrology is a key component in timing the execution of rituals in various religions and systems of magic, both Western and Eastern. The seven-day week became widely used in the Levant area during the early centuries of the Common Era. It spread eastward through Iran and India. It was introduced into the latter perhaps during the fourth or fifth centuries. I've not seen any evidence to suggest that Indian scholars or religious teachers were aware of the planets presiding over twenty-four hours. This wouldn't have made sense in any case, simply because the Indian calendar divides the day into thirty muhūrtas (each comprised of forty-eight modern minutes), rather than twenty-four hours. 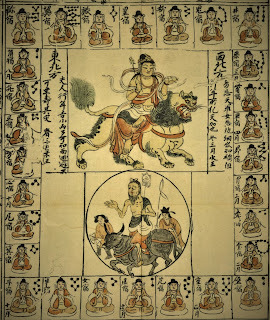 The seven-day week became part of the general “Indian calendar”, which is why it was incorporated as an essential component in the katarchic astrology of the early Tantric Buddhist tradition. We know this because of remarks in the Chinese commentary (produced between 724–727) on the Mahāvairocana Sūtra 大日經 (T 848), which probably came directly from the Indian master Śubhakarasiṃha 善無畏 (637–735), who at the time was resident in the Chinese capital. The commentary states that “there are nine graha [planets], which are the Sun, the Moon, Mars, Mercury, Jupiter, Venus and Saturn (the seven luminaries). If combined with Rāhu and Ketu, they altogether comprise nine graha 執有九種, 即是日月火水木金土七曜, 及與羅睺計都合爲九執 (T 1796, 39: 618a13-15).” The stated sequence of the planets here is that of the standard ordering, which of course indicates an already well-established understanding. The commentary goes on to explain that the planets, minus Rāhu and Ketu, have their “sequential convergences” (referring to the days of the week) and that their respective qualities also differ in being either positive or negative. These are said to be “explained in the Indian calendar,” but no further details are provided in the commentary. 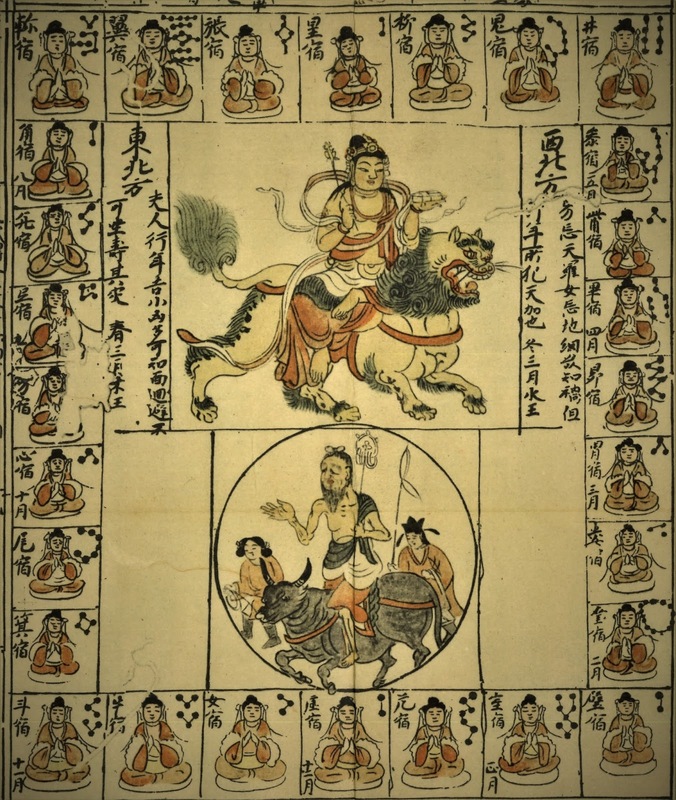 A few decades later, Amoghavajra 不空 (705–774) explained the seven-day week in detail in his astrology manual, the Xiuyao jing 宿曜經 (T 1299). Although it seems quite likely that the early Christian community in China would have observed the seven-day week this early on, such a small expatriate community in the capital had minimal if any influence on the host culture until around the late eighth century. It does not appear that Chinese writers took much interest in the small community of predominately Persian or Iranian Christians. One problem here is that some scholars in China in recent years have expressed doubts regarding the authenticity of the original Jesus-Messiah Scripture. Takakusu Junjirō 高楠順次郞 bought the original manuscript of this text from a Chinese seller in 1922. Some believe it is a modern forgery, while others think that someone might have reproduced the original textual content onto separate paper, and then sold it for a handsome profit. As it presently stands, nobody has conclusively determined whether this document is real or not, and painstaking philological research is ongoing. In any case, by the mid-eighth century, Buddhists had ample reason to start observing the seven-day week. Other communities, however, were already doing so. We know this because Amoghavajra in his manual tells the reader to ask Persians, Sogdians and Indians the day of the week if they happen to forget. Basically, during 750s and 760s, the seven-day week was still alien to most Chinese (they utilized the native system of time reckoning), including Buddhist monks, but plenty of foreigners, or at least communities that were originally from elsewhere, kept close track of the week, due to the sacredness and auspiciousness of Sunday. During the ninth century, the seven-day week became widespread amongst Chinese speakers. One word for Sunday, interestingly, was mi-ri 密日/蜜日, which is derived from the Sogdian word myr (“Sun”). Mi 密 here is reconstructed in Middle-Chinese as mjet (Schuessler IPA). Why Sogdian rather than Sanskrit, even within a Buddhist context? The answer is that the source of astrology shifted from Indian to Iranian sources starting around the first decade of the ninth century. This is abundantly evident from various documents that I have studied in detail. My relevant findings will be published in the near future. As to how the seven-day week ended up in Japan, Kūkai 空海 (774–835) carried with him a copy of the aforementioned Xiuyao jing. Not only that, but his biography also tells us that he insisted on implementation of it. Later, after Ennin 圓仁 (794–864) returned from China in 847, he also started employing the same text within Tendai. It is therefore fairly certain that Kūkai was, in fact, responsible for introducing the seven-day week to Japan, where it was observed more for its astrological significance more than anything else, since official timekeeping continued utilizing the earlier Chinese system. Throughout the following centuries, a number of texts demonstrate that Japanese Mikkyō (i.e., esoteric Buddhist) practitioners regularly took into consideration the seven-day week as one of several factors when determining the most auspicious time to carry out rituals. The day of the week was also significant in one area of Japanese Buddhist astral magic, since it determined the planetary deity presiding over one's day of birth. If you were born on a Saturday, the presiding deity would then be Saturn, to whom various offerings and rituals would be prescribed based, it seems, on an analysis of your natal horoscope. Astrology in medieval Japan, as was the case elsewhere in the contemporary world, was always closely tied in with the practice of magic. This is a topic to which I am devoting much attention at the moment. 1 Yano Michio, “Calendar, Astrology, and Astronomy,” in The Blackwell Companion to Hinduism, ed. Gavin Flood (Oxford: Blackwell Publishing, 2003), 383.